Candlelight is representative of many things. Peace, serenity, relaxation and romance are just a few. We are no doubt drawn to candlelight for the same reasons that our ancestors were once drawn to fire. Candles are an easy and elegant way to access our primitive attraction to the flame. Everyone loves them; that’s why they’re the go-to housewarming gift. While candles never get old, sometimes their arrangements do. If your votive holders are starting to look dingy, or your pillar looks like something off a witch’s altar, then it’s time to do some redecorating. 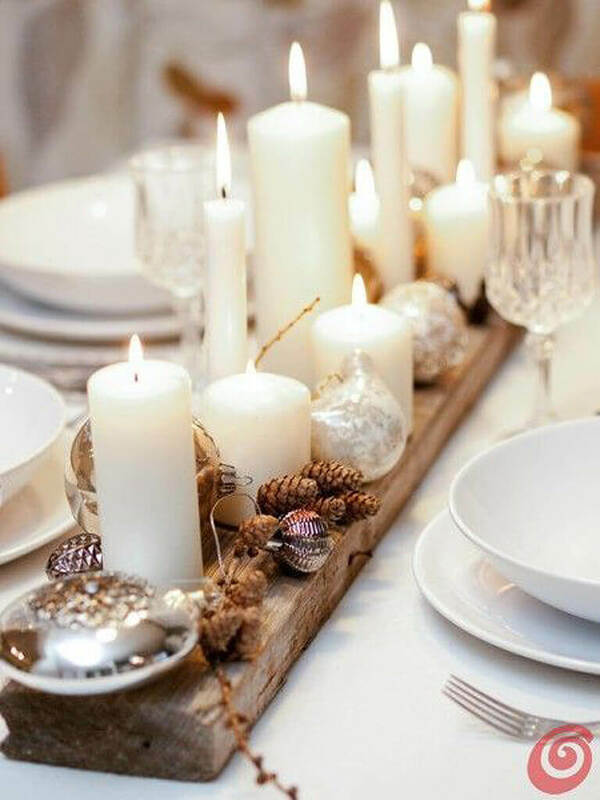 From centerpieces to hearth accents to holiday décor, there are hundreds of different ways that you can decorate with candles. 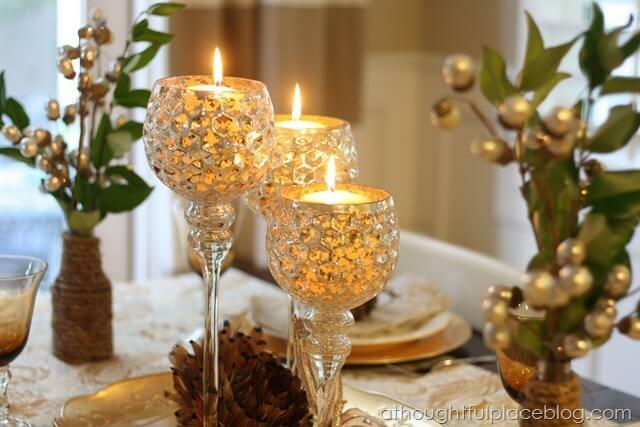 Here we present you with 34 of the best decorating with candle ideas. These savvy new home styling tips include something for every season and any space. Keep the warm glow going 365 days a year. Terrariums help solve two design problems in one. 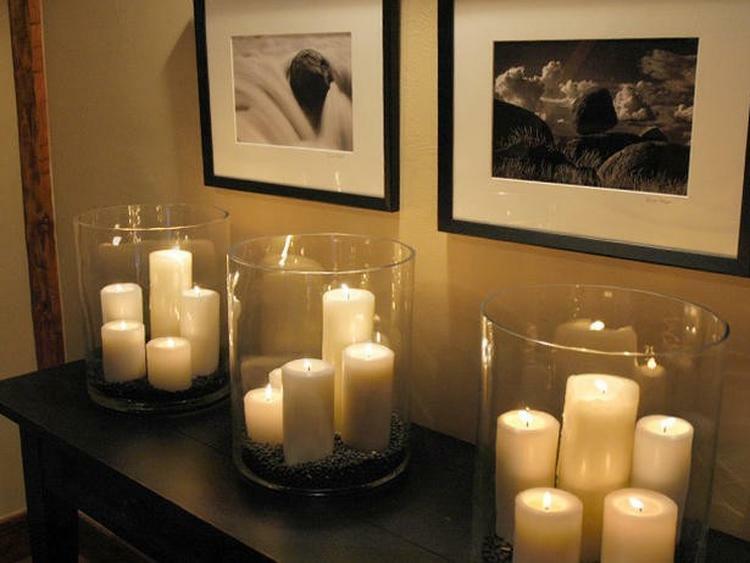 First, they add visual interest by grouping candles together, allowing you to play with height and texture. Second, they alleviate any worry you may have about setting your house on fire. The black rocks in the bottom provide a good foundation while increasing the impact of the candle arrangement. Lanterns are magical. So many stories and myths involve the lantern, so when you add lanterns to your decor, you bring a bit of that magic with you. They also provide a bit of safety for lit candles and help direct the light into a warm, peaceful glow. Use lanterns of different heights and shapes for more design drama. If you have a large flat space, such as on your coffee table, replicate the look of a fireplace by using candles of different textures and heights on a bed of smooth, polished rock. In the evening when you’re curling up with a book and a cup of tea, the candles provide the warm glow of a fireplace even when you don’t have one. Bonus points if your candles have ribbon, or in this case, textured bands. Sconces get a makeover using the rustic style of Farmhouse design. Aged barn wood provides the anchor to simple iron and glass sconces with wide pillar style candles. 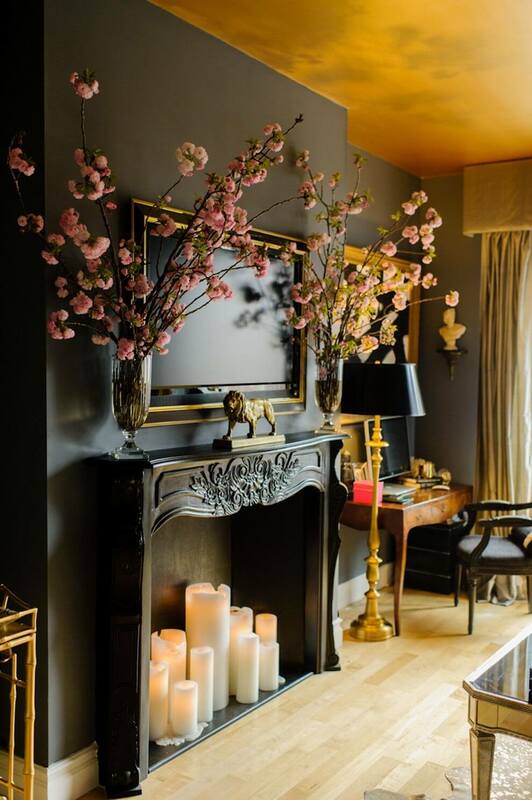 Throw in a few tea lights below in attractive containers, and you have the unique charm of simple living right above your mantle. Shabby chic gives you the chance to repurpose things you may not have used before. 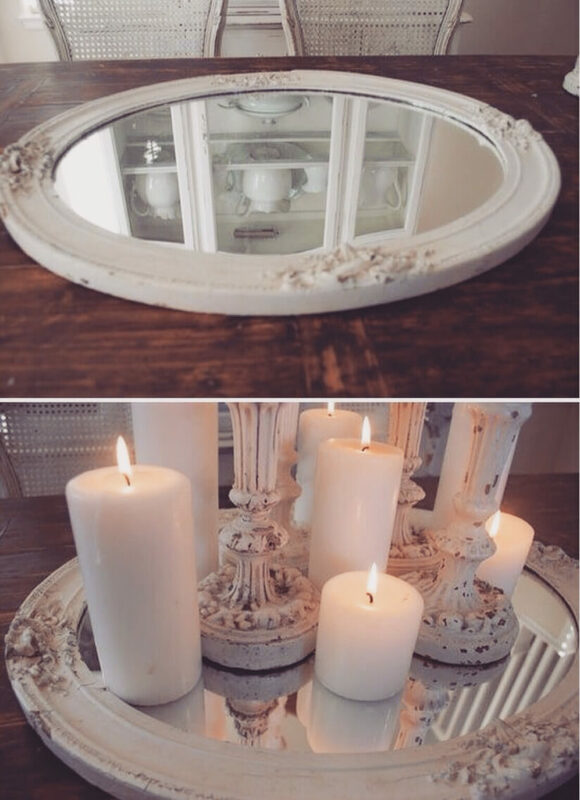 This time, take an old frame mirror and give it a makeover as a candle tray. The mirror will reflect the delicate glow of the candles, dramatically increasing their light and adding an unexpected reflective element to your arrangement. 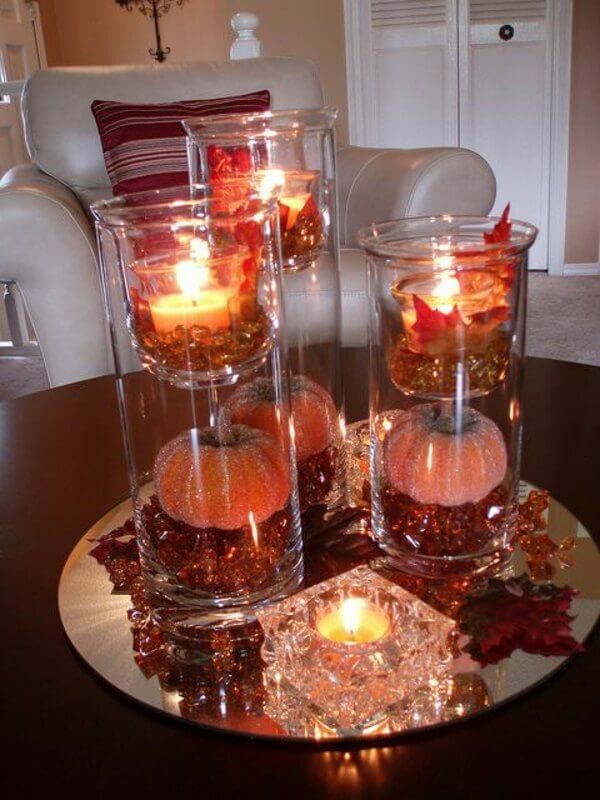 Add candle holders in a similar style and color for a twist. White and green are a natural pairing. 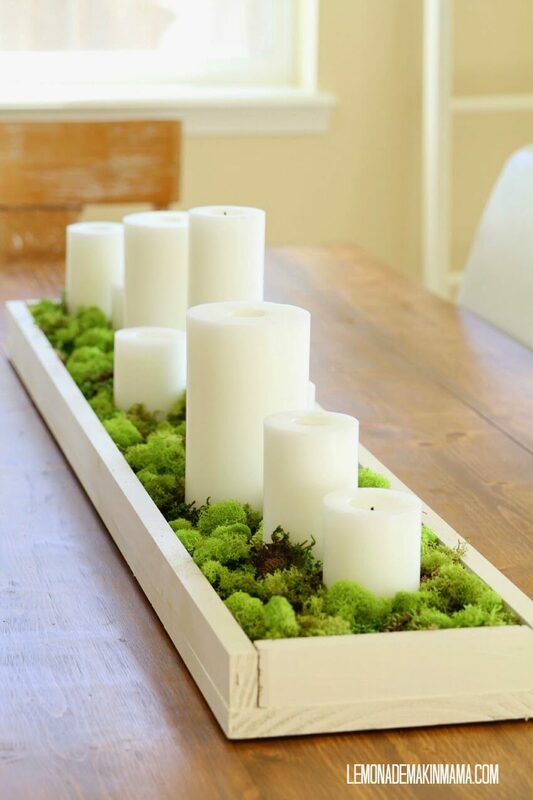 This arrangement uses natural moss bedding to soften the architectural white of the candles and tray. Together, they’re a luxe yet minimal centerpiece that brings a bit of mother nature inside where she can help soothe and relax the atmosphere. If you can’t find live moss, substitute realistic fake moss from your local craft store. Forget mimicking a fireplace; make one with this fun fireplace DIY. 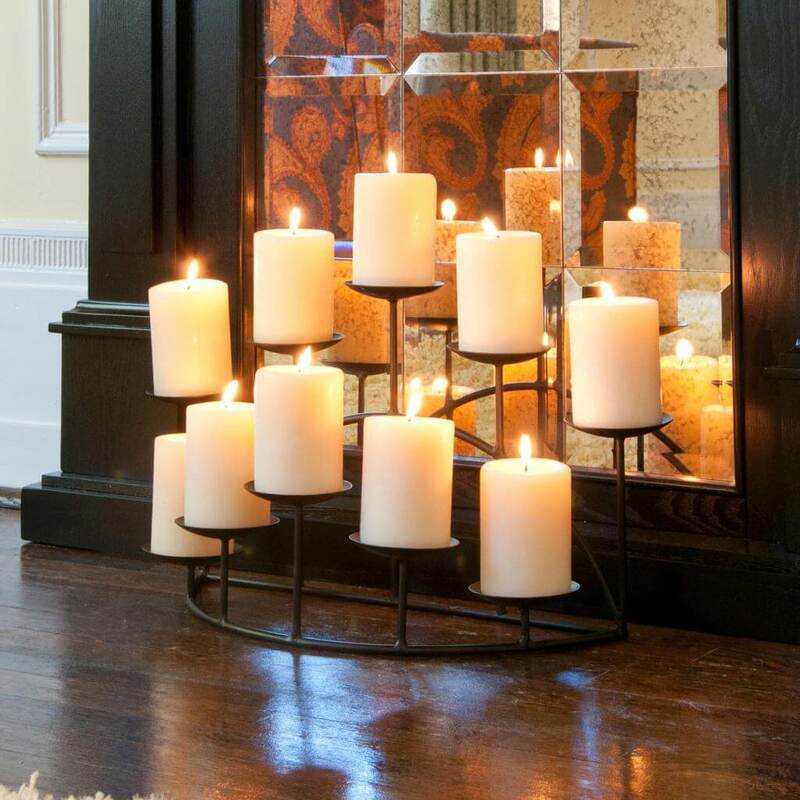 Place pillar candles of varying heights underneath your mantle for a fun twist on the fireplace. The different heights mimic the natural shape of fire. In the evenings, the light will behave just like a fireplace without the excess heat. For a tabletop arrangement, use elements already found on a table. Glittery goblets are the perfect holders for delicate candles. The light from the candle reflects through the glass and adds a magical touch to your dinner party decor. Decorate with your flower arrangements as usual and watch your guests’ eyes twinkle. Mason jars are another design staple. Here, they provide the perfect simple votive for a white tray and sparse greenery. Tie them up with burlap string for a more rustic look. 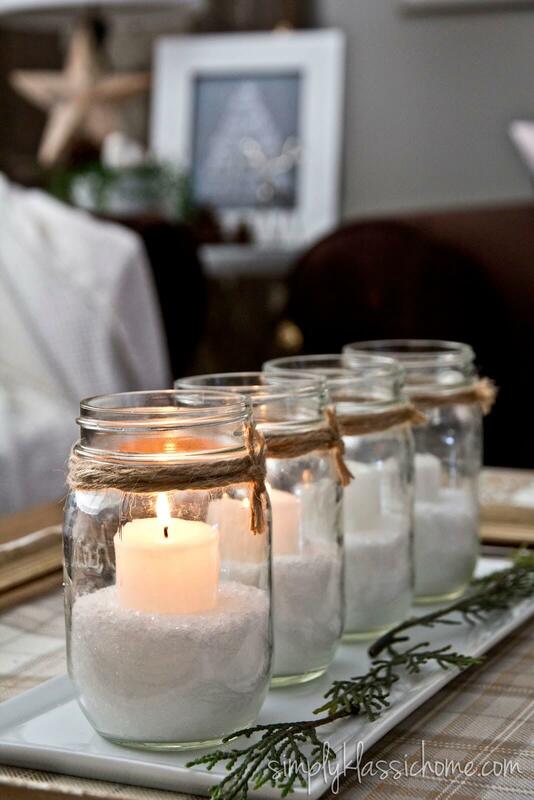 White sand filler reflects just enough light that the jars twinkle but don’t overwhelm the simple design. Use in-season greenery for an easy design element. Winter weather makes us long for soft materials. Give your candles a winter makeover with sweater votive holders. They’re the perfect foil to icy silver candle holders and take things from high style to down-home comfort. 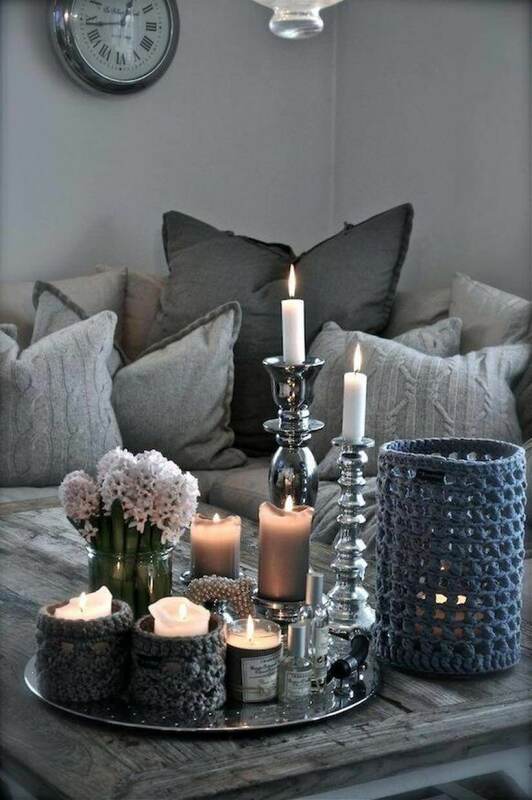 Even better, match your accent pillows to the sweater votives for a warm space you’ll never want to leave. Zen gardens have sparse but recognizable elements. Use simple stones, water, and a well-placed flower in this candle arrangement to bring that sense of calm to your tabletop. The large glass jar holds everything together and allows you to choose taller candles for a longer burn. The best flowers are dramatic singles such as peonies or gardenias. You bought that gorgeous trifle jar but never made a single trifle. Don’t let it gather dust. 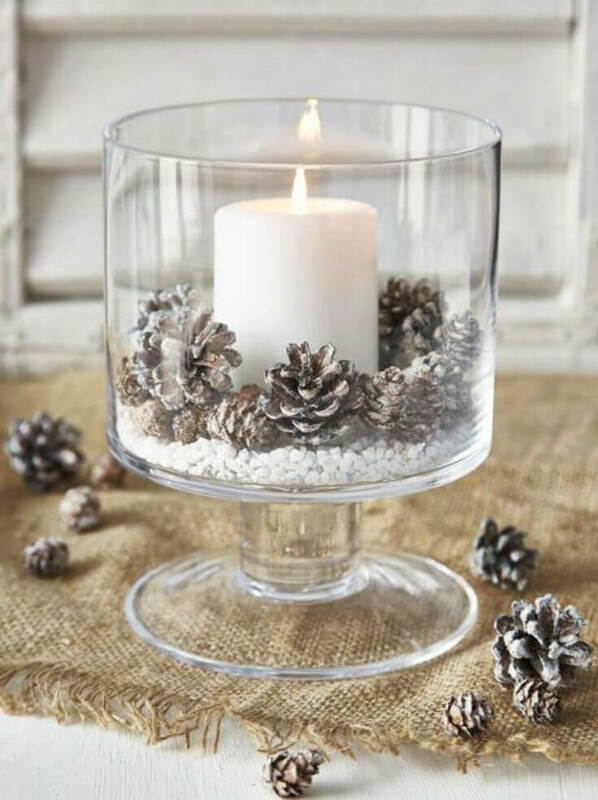 Glass trifles are the perfect width and depth to create wintery candle arrangements. For this one, white rocks mimic snow and dusted pinecones add to the rustic forest feel. A single white candle in the middle is the perfect touch. Candle decorations don’t have to be complicated. For this design, a simple square cube adds visual interest as a foil for the rounded edges of white pillar candles. Group them together using varying heights for a stunning, five-second centerpiece. Place it alone on a coffee table for maximum impact. Another simple design trick is to multiply your light using a well-placed mirror. Here, a basic modern candelabra is dramatic by itself. 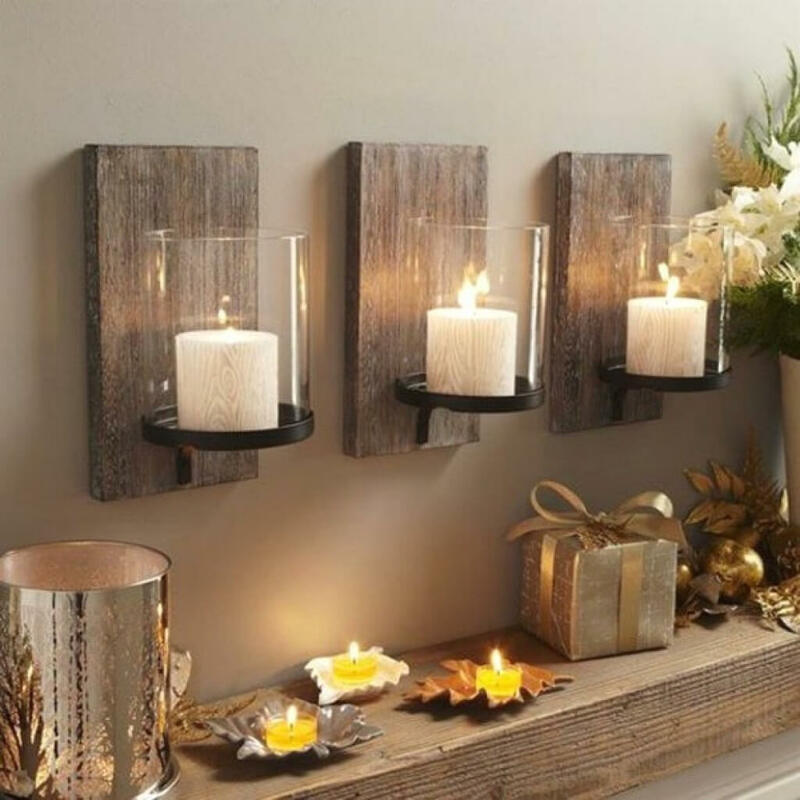 Add a mirror (and bonus if the mirror has design elements such as different panels) to make it feel like you’ve got twice as many candles as you actually do. Simple and impactful. 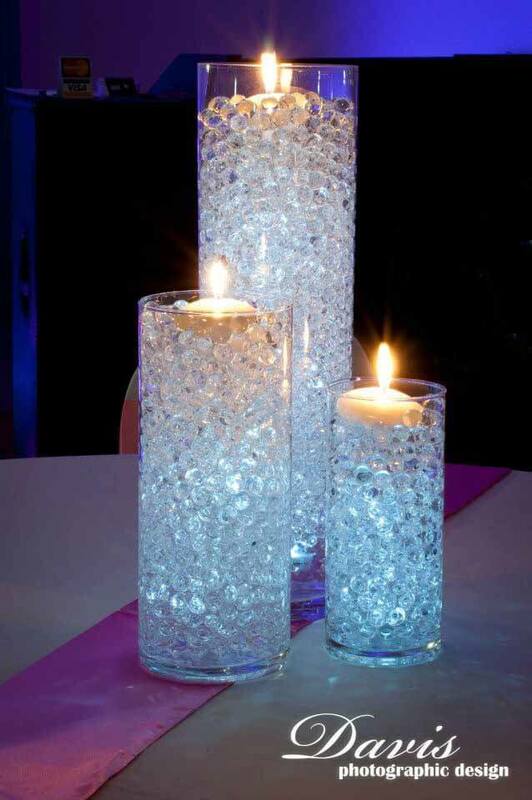 Improve your candle game by taking plain glass votives to a new level. 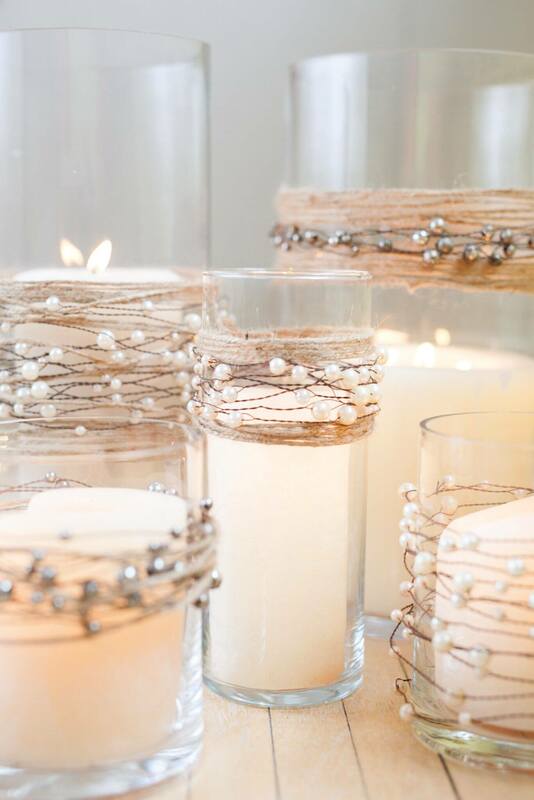 Delicate strands of string and white beads add a fairy-like charm to these simple glass candles. Vary the texture using burlap string for visual interest. If you want a permanent solution, you can use tiny bits of glue to hold the strings in place. Otherwise, leave them unglued for a design you can alter later. 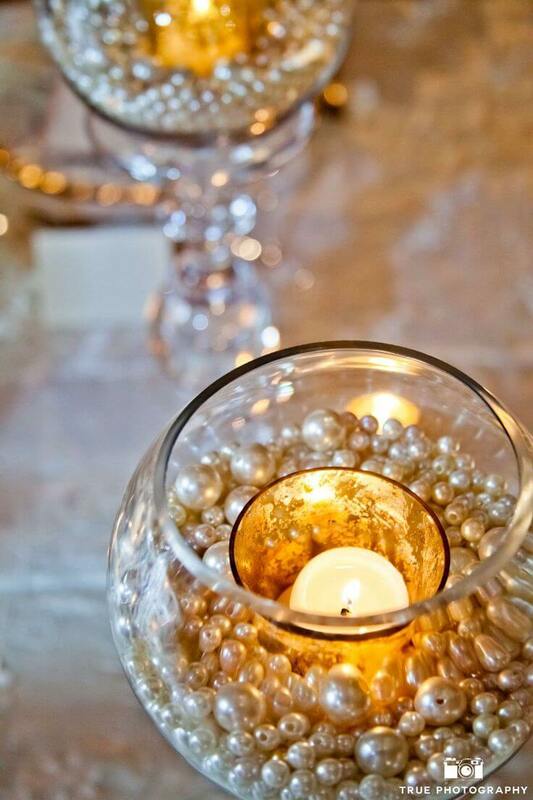 Wedding decorations get a seriously glam upgrade using silver washed beads as a bed for nestled candles. Use mercury style glass for a bit of European royal style and use glass holders of different shapes and heights for a more authentic and less fussy look. In Chinese Feng Shui design, wood is a natural foil to fire. Here wooden pillars provide a solid base for flickering white candles. 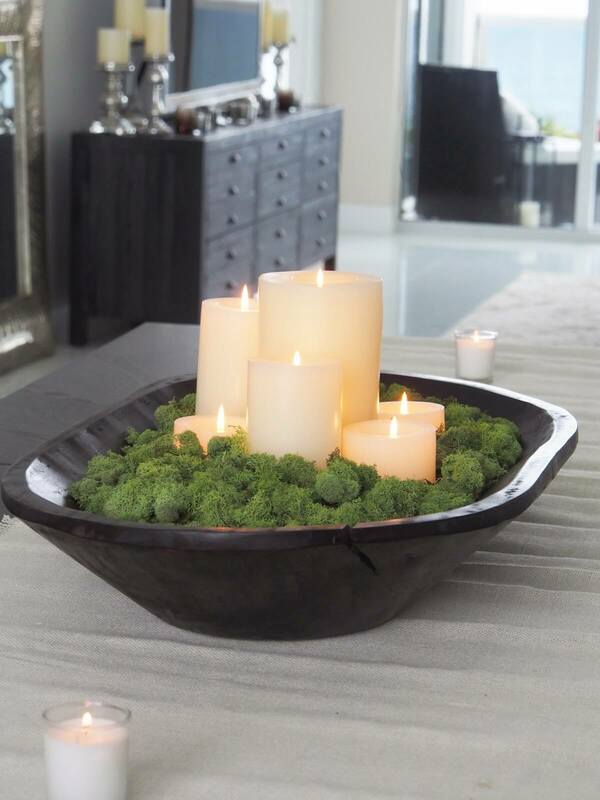 Choose dark woods for the most dramatic impact and group them together in groups of three for a pleasing arrangement. Add personal elements to the table such as family photos and a vase with outdoor elements to tie everything together. 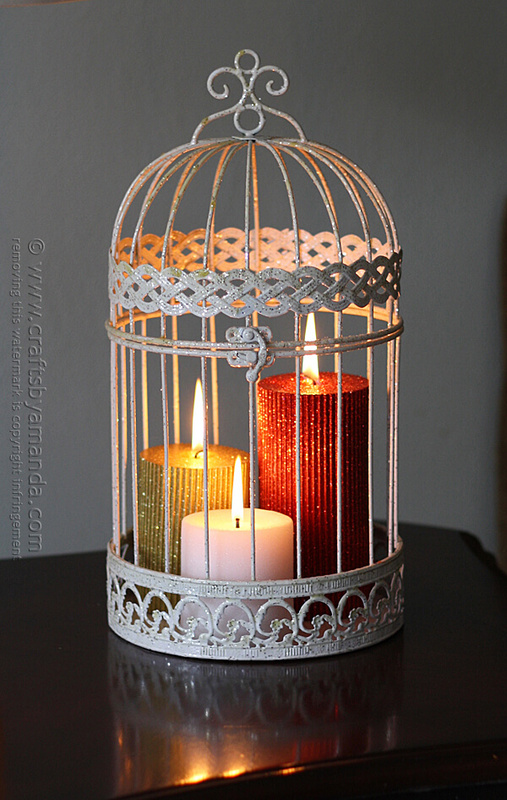 A glittery birdcage is the perfect house for a trio of whimsical candles. Don’t just choose plain white. Use color and texture for a more boho design. It says “I’ve traveled the world and collected these candles for my cabinet of curiosities” without too much effort. Fill the birdcage to capacity, but be sure to leave some room for the flame. Take inspiration from Sleeping Beauty’s Fairy godmothers’ cottage in the forest with this dark wooden bowl filled with soft green moss and white pillar candles. Group the candles together in the middle to leave room for the lush green on either side. Florist moss is living moss and requires just a spritz of water every so often to live for a long time. Shabby chic wouldn’t be the same without some, upcycled lanterns. 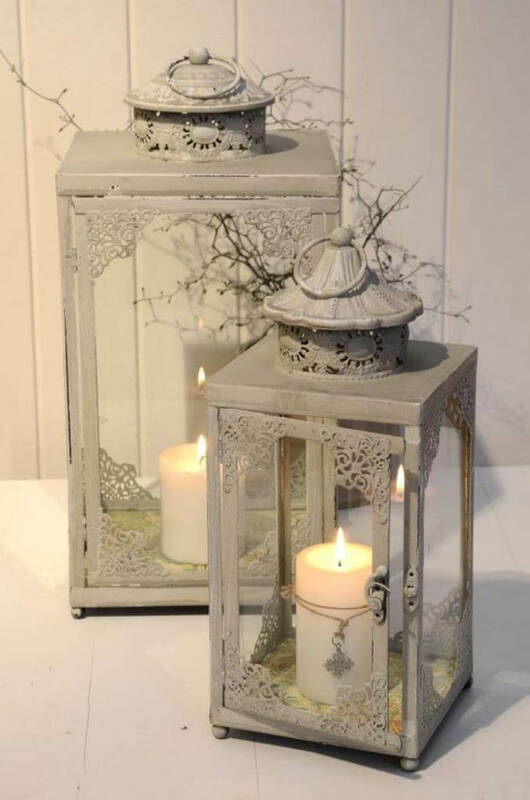 Choose lanterns with ornate details like these with lace-detail glass walls and top. 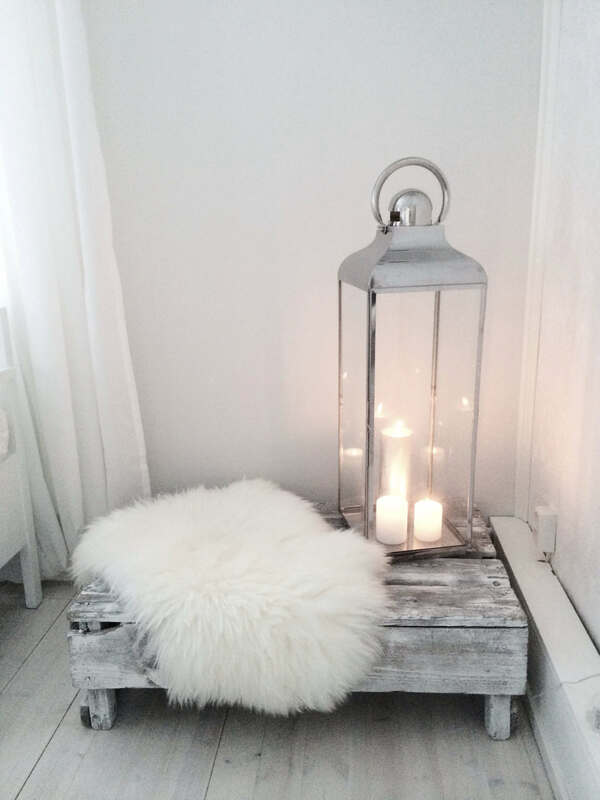 Paint them distressed white and add a single white candle inside for maximum drama. If you want, add a tiny piece of string with a charm to decorate the candle as well. Floating votives are magical. Place small twigs in the bottom for a minimal nature-inspired design. 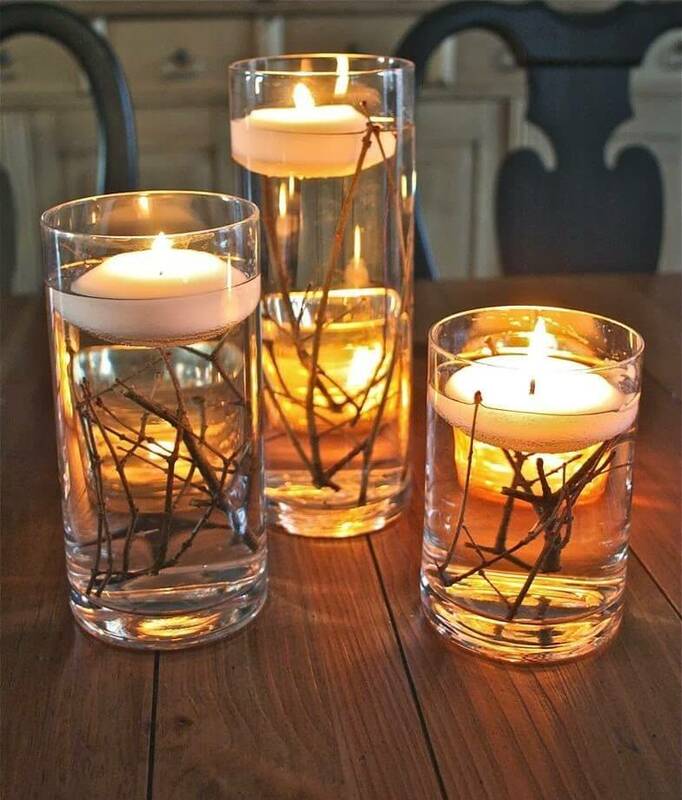 Group candles together in threes for visual interest and vary the heights and placement of the twigs for a “same but different” design that looks great on a coffee table or breakfast nook table. 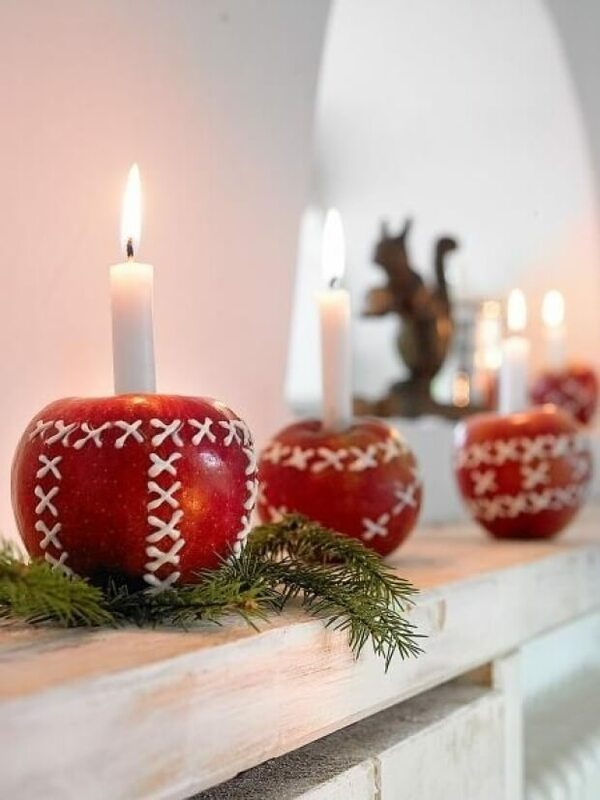 Use fresh apples for impromptu candle holders that smell great and look amazing. If you’re feeling extra DIY, use white paint to create little cross stitch designs for additional impact. This decoration is something you can do when you’re low on candle holders and party decorations, but still want to have the best decorations of anyone around. See your glassware in a whole new way with these upside-down candle holders. 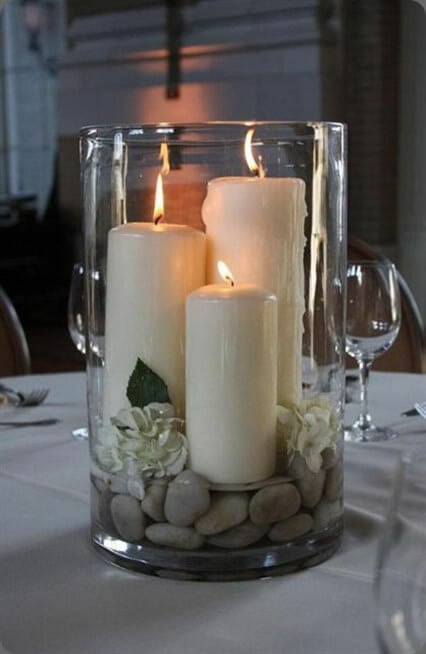 The bases of bar glasses are perfect for pillar candles. Place dramatic flowers underneath the goblet portion for a huge impact using simple household items. In a matter of seconds, you’ve got a creative, flickering centerpiece. 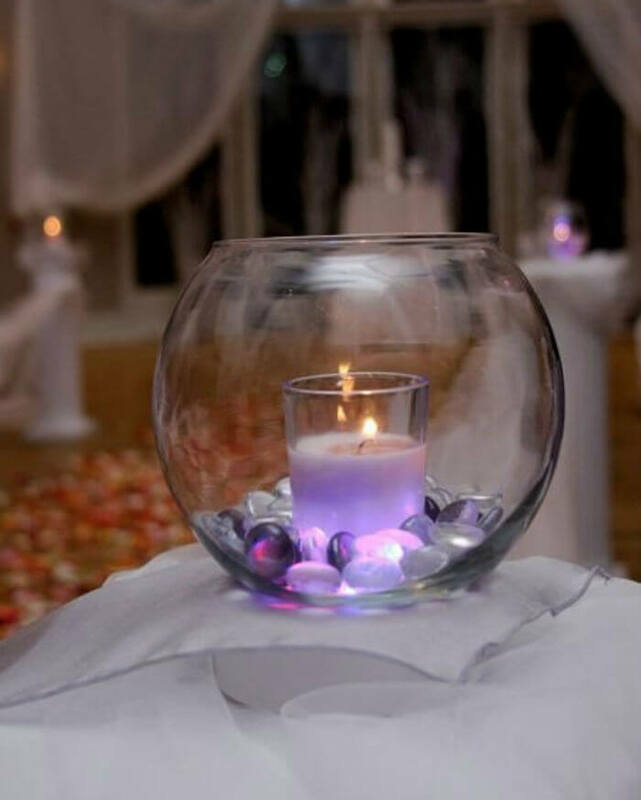 Fishbowls are another way to increase the impact of simple glass votives. Place a glass candle holder inside a classic fishbowl and fill in the space around it with items like flowers, rocks, or sand for a fun decoration that can change for seasons, holidays, and event styles. Here, they’ve used glass stones and colorful lights for a fun design touch. The best part? Fishbowls are inexpensive. Minimalist design keeps all the materials the same across different elements. 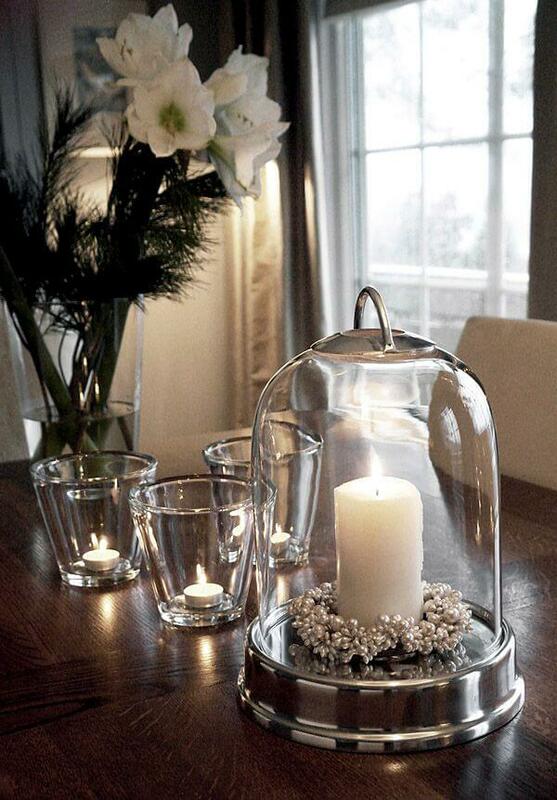 The large glass bell jar complements the simple votives and tea lights. Inside the bell jar, a white candle and silver decorations that match the silver accents on the jar give visual interest while maintaining minimalist style. As always, group things in threes for a pleasing touch. This one takes some prep time, but it’s worth it for a gothic inspired, icy decoration. 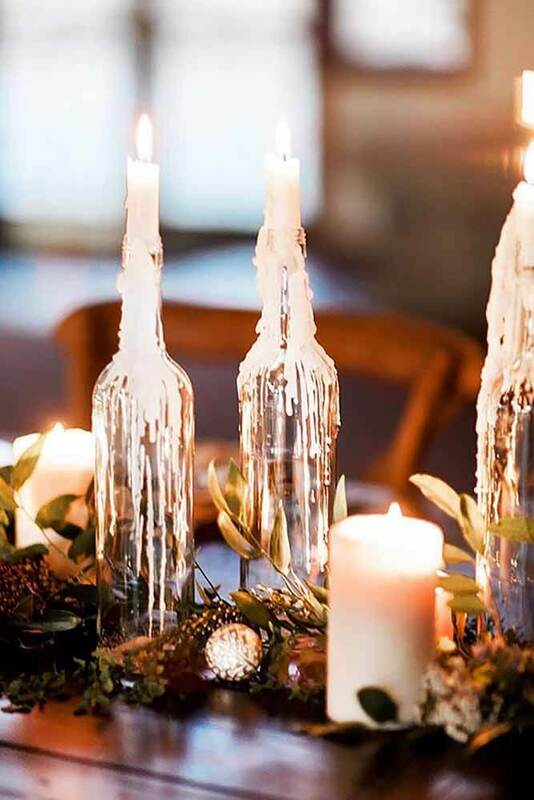 Take taper candles and stick them into some simple glass bottles. Allow the wax to burn down for a few hours until it resembles icicles. When they look just the way you like, blow out the candle and carefully place them in your centerpieces and add pillar candles and greenery. Pillar candles look great with a simple green filling. 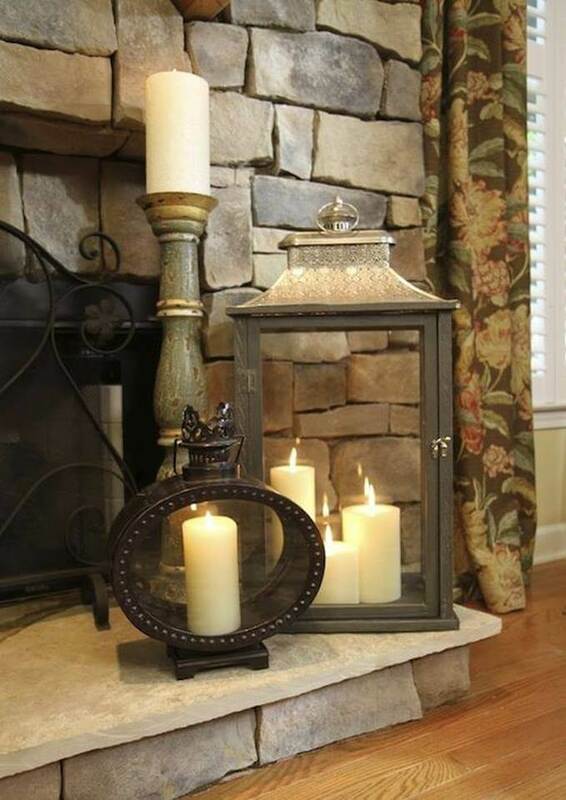 They look even better on architectural pedestal candle holders. Choose holders with varying heights and stem decorations, but keep everything the same simple glass. It’s a nature-inspired arrangement that looks best arranged in groups of odd numbers. 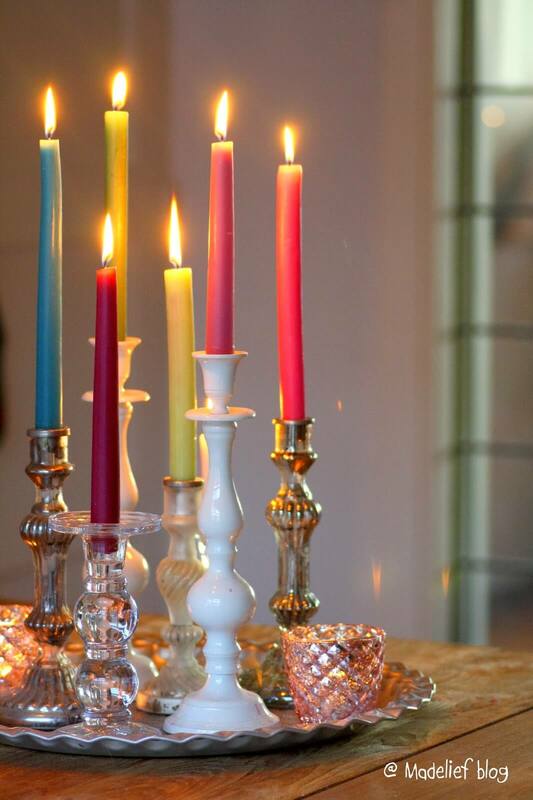 Give vintage candle holders the whimsy they deserve with colored taper candles. You can keep colors in the same family or go all out with different shades and still have the same maximal boho-chic look. Try not to overthink things here. The more whimsical, the better. Side note: the best place to pick up vintage candle holders is at your local yard sale! Winter farmhouse style is perfect for your rustic dinner party. 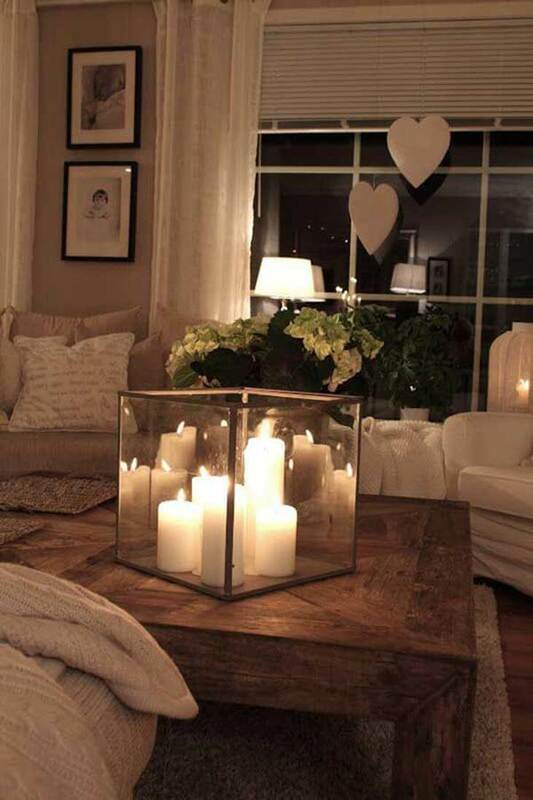 Use a simple aged wood board and add pillar candles. In between, simple glass ornaments, pinecones, and bare winter twigs complete the look. Vary the heights and sizes of candles for a casual design, or use tall pillars for a more formal twist. 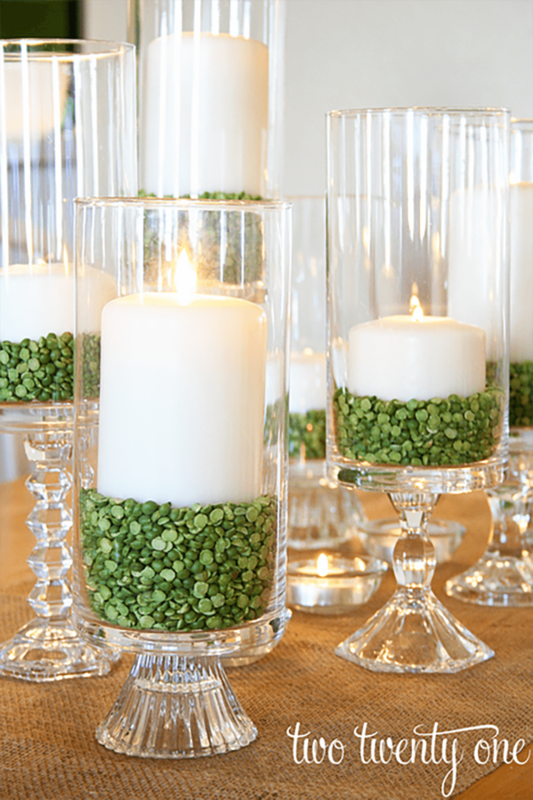 For floating votives, use glass marbles for a twist on the oil look. Glass marbles are simple, just like oil, but offer guests and interesting visual texture that’s an unexpected twist. 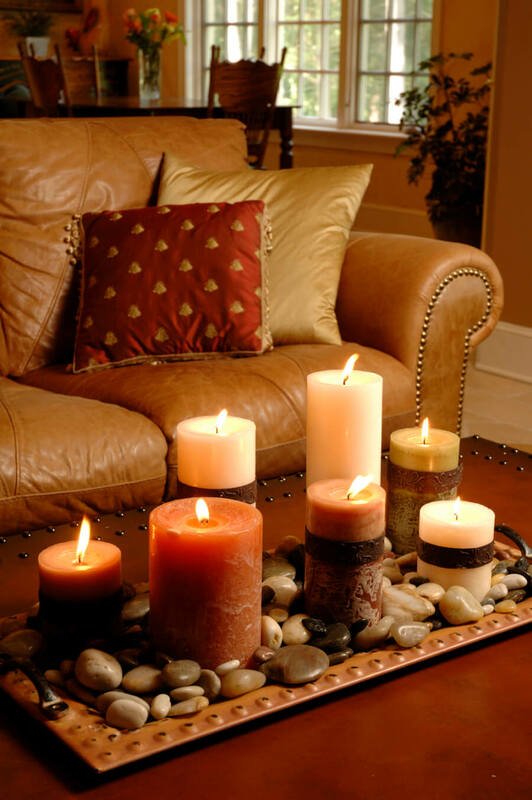 Grouping candles of varying heights into collections of three further enhance the impact and keep things clean. 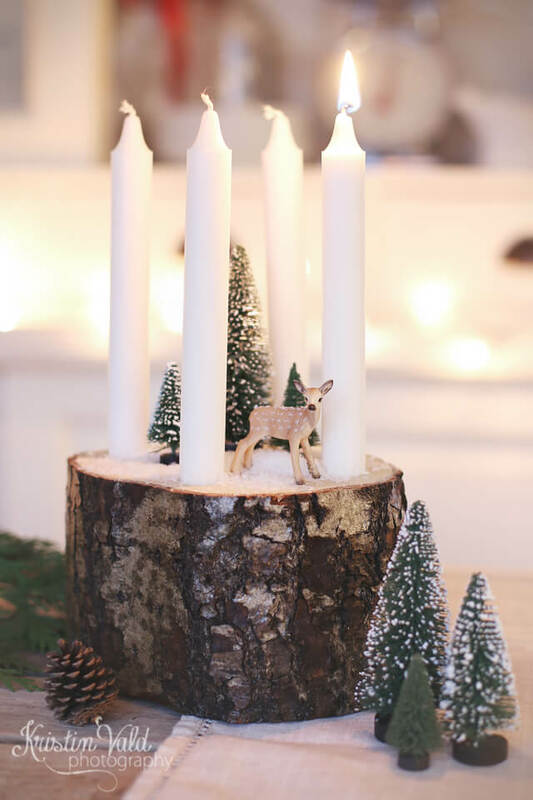 Sweet miniature deer and trees look amazing nestled in between long white taper candles. Use a tree cutting as a base for interesting texture and to anchor the winter outdoor scene together. Take the scene even further by arranging little trees and pine cones on the table surrounding the log. 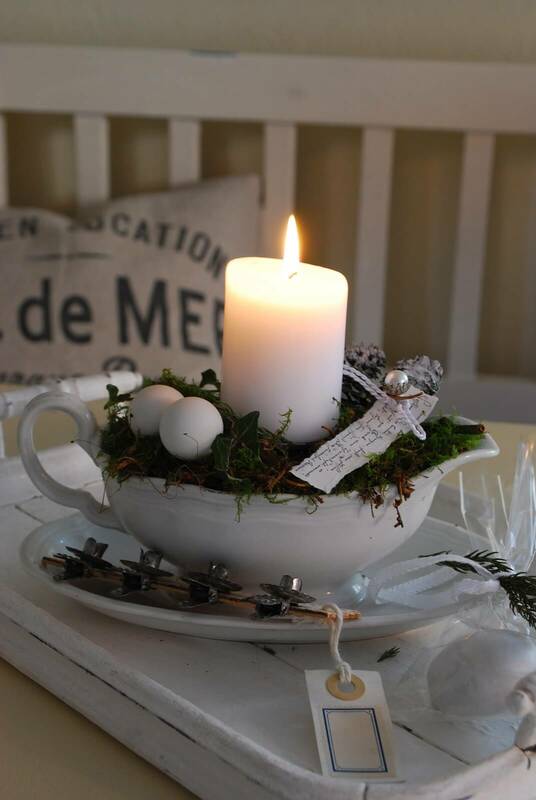 A vintage gravy boat gets a new life with this beautiful, nature-inspired candle arrangement. Use florist moss to fill up the boat and accent it with little bird eggs and a single white pillar candle in the center. Pine cones accent the other side, and a handwritten note adds a personal touch. Place the boat in its serving tray and use a small silver accent piece to bring everything together. 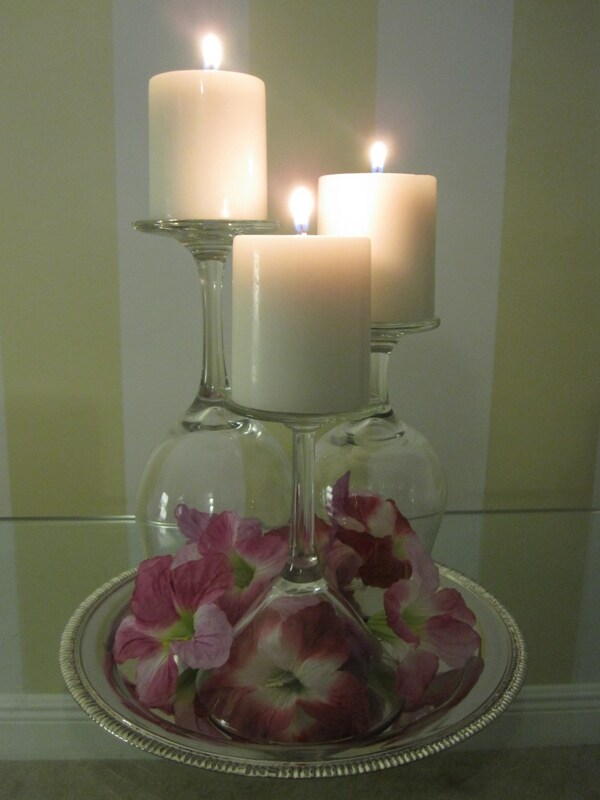 These double votive holders both hold candles and let you create a scene below. Here, festive pumpkins get everyone in a fall mood. 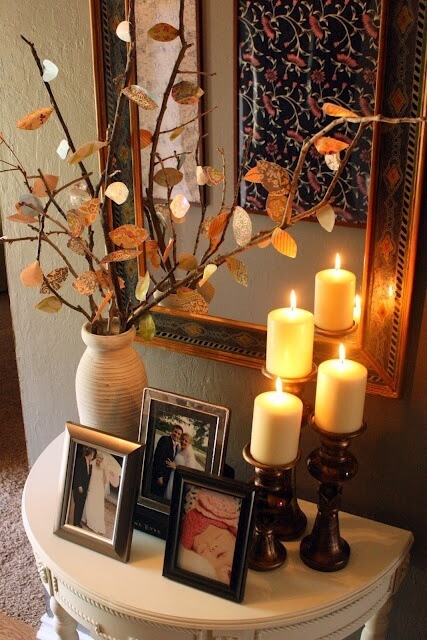 Use red leaves to accent the orange and place white candles on top. Bonus, use a mirrored tray to magnify light and make it feel like there are twice as many candles as there are. You don’t need a lot for good design. This corner piece is a simple, minimal silver lantern with a single candle. Put it on top of an aged wood stool and throw something soft into the mix like this fur throw. It’s comfortable and easy, and the textures play off each other for beautiful, high style.